Application: Item# 88002 Wireless Doorbell Box® has two additional holes on the bottom to allow access to the two security screws on the bottom of your Video Doorbell. These "Security Screws" require a special screw driver that is provided with your Video Doorbell. If your unit will not stay on the base until the screws are tightened, or if you want the extra security the screws provide, order Item# 88002. Some Video Doorbell models allow you to snap the unit onto the base without the need to tighten the screws. If that is the case with your doorbell and you don't want to use the security screws, then the standard Doorbell Box® will work. Type "88001" into the search window above or click the link below for the Standard Doorbell Box®. Check to see if you have a RING 2® or RING PRO® video doorbell and choose the appropriate product below. No Returns and No Refunds: Each box is handcrafted and will not look as perfect as in the picture. Also, because they now use a different screwdriver, the holes are now larger than those pictured in the photo. Those holes are too large to be drilled, so they are melted into the case using a different method. This item is not manufactured on an assembly line, so there will be imperfections that are not aesthetically pleasing. For that reason, please note that we do not accept returns nor do we offer refunds on this product. No exceptions. They are meant to be functional and will perform as intended. However, if you are especially concerned about appearances, please do not order this item. Installation: A clear plastic cover (not pictured) is included with your Doorbell Box® which should NOT be used when you install your Doorbell Box®. Leave the front open to allow the motion sensor to work, and to allow access to the doorbell button. Use the clear cover only to further protect your Video Doorbell during exceptionally extreme storms when driving rain or blizzard conditions are forecast. Use painter's masking tape to secure the cover to the base during the storm. Remove the cover after the storm. Weather Protection: Excellent protection from moisture and the elements with a secure mounting base for your video doorbell. (Video Doorbell is not included.) Clear plastic housing with an open front is pre-drilled with holes for mounting screws and wires when your application uses the preferred installation method of utilizing your existing doorbell wiring. Mount Anywhere: If you are mounting your Video Doorbell in a remote location that does not use existing doorbell wiring, you may wish to order the Wireless Doorbell Box® instead that provides access to the Security Screws on the bottom. Item# 88002 is designed for Video Doorbells that will require removal for periodic recharging and/or use of the security screws is desired or required. Easy to Install: The Doorbell Box® allows you to easily mount your Video Doorbell to clapboard siding or any other uneven surface inside this attractive clear plastic protective housing that will not discolor. The sturdy Doorbell Box® comes with pre-drilled holes for easy mounting of the Ring® Video Doorbell and can also be modified for the SkyBell® Wi-Fi Doorbell, Zmodo®, VTech® and others. Theft Resistant: Once installed inside the Doorbell Box®, your Video Doorbell is less likely to be stolen. 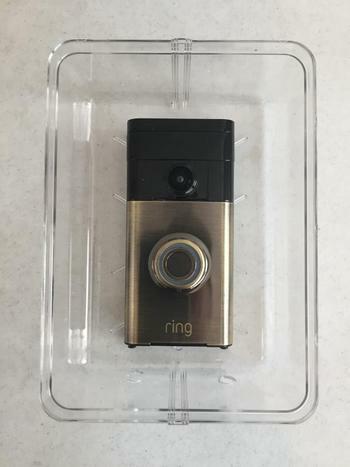 Although it is unlikely vandals will attempt to steal your video doorbell, once installed inside the Doorbell Box®​, the RING doorbell is more difficult to remove. Item# 88002 allows use of the security screws on the bottom of your doorbell and proprietary screw driver for added theft resistance. Protect Your Investment: The Doorbell Box® helps to protect your video doorbell from driving rain, ice storms, blizzard snow storms, high humidity and other adverse weather conditions. Although weather-resistant, these video doorbell devices are not water proof or moisture proof. Unless you live in a sunny climate where it never snows, never rains and there is no humidity, moisture will collect behind it, and your video doorbell will eventually fail. Protects from Moisture: Moisture collecting behind the base of your Video Doorbell is the number one cause of failure. Housing your video doorbell inside the Doorbell Box® will prevent that problem, and you will not need to worry about replacing it in a year or two or even many years from now. It protects from moisture collecting behind the base, and greatly improves protection from the elements. Works on All Surfaces: It is virtually impossible to mount your video doorbell on clapboard siding or rough stucco or any other irregular surface without a perfectly flat mounting platform that the Doorbell Box® provides. Moisture that collects behind the video doorbell is the number one cause of failure. Protect your video doorbell investment with this clear plastic housing that also protects from the elements on all sides. The pre-drilled holes make it a cinch to mount your RING Video Doorbell, and the Doorbell Box® provides a clear 180 degree view of the entire video camera range. Same Day Shipping: Ships the same day for orders placed Monday through Friday by 12:00 Noon ET via Priority Mail 2-DAY™ Service with Tracking for $15.00 S/H. For other shipping options, call 702-617-3300 Mon-Sat 8am-8pm ET to order by phone. No Shipping Outside the USA: Sorry, but we do not ship to Canada or anywhere else outside the 50 United States. Doorbell Box® ​is a trademark of Accredited Security, a Nevada Corporation and Member of the Southern Nevada Better Business Bureau since 2006. RING®, SkyBell®, Zmodo® and VTech® are trademarks of the respective manufacturers. Accredited is not affiliated with any of these manufacturers.